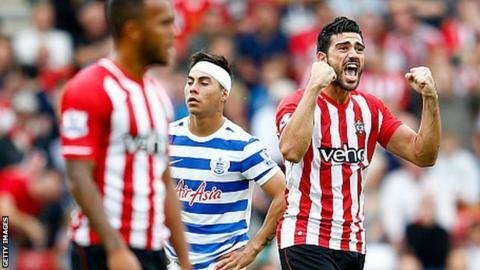 Second-placed Southampton made it six wins in a row in all competitions to beat struggling QPR. The hosts, enjoying their best start to a Premier League season despite a summer of upheaval, were the better side with Dusan Tadic hitting a post. Ryan Bertrand gave Southampton the lead, drilling low beneath Robert Green, before Charlie Austin levelled with a superb volley on the turn. But Graziano Pelle's stunning scissor-kick clinched the win. The Italian striker's fifth goal of the season ensured Saints recorded a fourth successive victory in the Premier League, and kept them three points adrift of leaders Chelsea. QPR can take heart from the fact they were defensively more secure than of late, Harry Redknapp's side having conceded eight goals in their last two games on the road. The visitors also scored away from home for the first time this season. But a third successive away defeat leaves the newly promoted west Londoners in the bottom three and compounds a miserable afternoon for Redknapp, who received a far from welcome reception on his return to a club that he guided to relegation in 2005. St Mary's is a much happier place these days, with Southampton enjoying their best start to a season in the top division since the 1983-84 season, when they finished second. Their haul of 13 points in six matches has helped make the summer's mass exodus of players a distant memory. The speed with which their new recruits have settled has helped, with £11.8m midfielder Sadio Mane impressing on his Premier League debut, and Tadic causing problems for QPR. It was Mane, 22, who put Morgan Schneiderlin through just before the break for the best chance of the half, with the Frenchman's low effort a fraction wide. As momentum continued with Southampton after the break, Senegal's Mane was instrumental in a deserved opening goal for the hosts. The winger, making his second appearance after being granted his work permit last week, found Bertrand with a delightful back-heel and the on-loan defender struck for his first goal for the Saints. It was a second half which will be remembered for exquisite strikes. For the equaliser, QPR's Austin controlled the ball with his left foot before swivelling and beating Fraser Forster with a sublime right-footed effort. Moments later, though, Pelle restored Southampton's lead when he flicked the ball up with his back to goal and lashed a volley past the helpless Robert Green. Plenty of chances followed - with Steven Davis going close for Saints and a Niko Kranjcar free-kick hitting the crossbar for QPR - but Southampton held firm to continue their winning streak after Tuesday's 2-1 victory at Arsenal in the League Cup. Southampton manager Ronald Koeman: "It was very tough. We expected that. We told the boys that after last Tuesday (Capital One Cup win over Arsenal) it'd be more difficult. "All the credit to QPR about the second half. We know we have offensive qualities but in a difficult second half, to keep the spirit and the belief to win the game, it was a good compliment to the boys. "The most important is that we believe in our way of playing and the second half was a fantastic second half from both sides." QPR manager Harry Redknapp: "We came back strongly after their goal and I felt we had every opportunity at that stage of the game, but their centre-forward produced a world-class goal. Niko Kranjcar hit a fantastic free-kick but it hit the woodwork and we couldn't get the break. "We didn't give up and it was a much better performance. Charlie Austin took his goal well and that's encouraging. "He's proven that he can score goals in the Premier League. Southampton are a good side but I felt we stuck at it and we got a bit more belief in ourselves and we've got to continue to believe." Match ends, Southampton 2, Queens Park Rangers 1. Second Half ends, Southampton 2, Queens Park Rangers 1. Graziano Pellè (Southampton) wins a free kick on the left wing. Corner, Queens Park Rangers. Conceded by Morgan Schneiderlin. Substitution, Southampton. Matt Targett replaces Dusan Tadic. Dusan Tadic (Southampton) hits the left post with a left footed shot from the left side of the six yard box. Assisted by Jack Cork with a through ball. Attempt missed. Leroy Fer (Queens Park Rangers) left footed shot from outside the box misses to the left. Assisted by Niko Kranjcar. Attempt missed. Steven Davis (Southampton) right footed shot from outside the box is close, but misses to the left from a direct free kick. Attempt blocked. Dusan Tadic (Southampton) right footed shot from outside the box is blocked. Assisted by Graziano Pellè. Attempt missed. Steven Caulker (Queens Park Rangers) header from the centre of the box is too high following a set piece situation. Niko Kranjcar (Queens Park Rangers) hits the bar with a right footed shot from outside the box from a direct free kick. Corner, Queens Park Rangers. Conceded by Ryan Bertrand. Attempt missed. Junior Hoilett (Queens Park Rangers) right footed shot from outside the box misses to the left. Assisted by Karl Henry. Corner, Southampton. Conceded by Steven Caulker. Attempt saved. Shane Long (Southampton) right footed shot from the left side of the box is saved in the bottom right corner. Assisted by Steven Davis with a through ball. Corner, Southampton. Conceded by Mauricio Isla. Attempt missed. Charlie Austin (Queens Park Rangers) header from the centre of the box is close, but misses to the left. Assisted by Leroy Fer with a cross. Attempt saved. Steven Davis (Southampton) left footed shot from outside the box is saved in the top right corner. Goal! Southampton 2, Queens Park Rangers 1. Graziano Pellè (Southampton) right footed shot from the centre of the box to the bottom right corner. Assisted by Dusan Tadic with a headed pass. Substitution, Southampton. Shane Long replaces Sadio Mané. Goal! Southampton 1, Queens Park Rangers 1. Charlie Austin (Queens Park Rangers) left footed shot from the centre of the box to the bottom right corner. Assisted by Eduardo Vargas. Mauricio Isla (Queens Park Rangers) wins a free kick on the right wing. Offside, Southampton. Victor Wanyama tries a through ball, but Sadio Mané is caught offside.